Only 8,726 Miles! Boasts 22 Highway MPG and 14 City MPG! This GMC Yukon delivers a Gas V8 6.2L/376 engine powering this Automatic transmission. WHEELS, 22" X 9" (55.9 CM X 22.9 CM), STEEL, TRANSMISSION, 10-SPEED AUTOMATIC electronically controlled with overdrive, tow/haul mode and tap up/tap down shifting (STD), TIRES, P285/45R22, ALL SEASON, BLACKWALL. 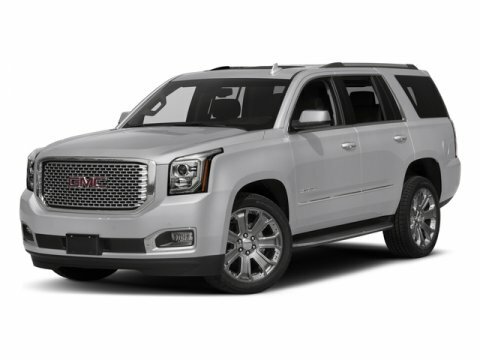 * This GMC Yukon Features the Following Options *SUNROOF, POWER, TILT-SLIDING with express-open and close and wind deflector, SEATS, SECOND ROW BUCKET, POWER RELEASE (STD), SEATS, FRONT BUCKET WITH PERFORATED LEATHER-APPOINTED heated and ventilated seat cushions, 12-way power driver and passenger seat includes 6-way power cushions, driver seat 2-position memory, 4-way power lumbar control and power recline (STD), REAR AXLE, 3.23, LPO, REAR SEAT DVD ENTERTAINMENT SYSTEM, INCLUDES DUAL DVD HEADRESTS and two analog headphones (dealer-installed), LPO, CARGO MAT, ALL-WEATHER, BLACK (DEALER-INSTALLED), LPO, 22" (55.9 CM) 5-SPOKE ULTRA-BRIGHT MACHINED WHEELS WITH HIGH-GLOSS BLACK LPO wheels will come with 4 steel 22" wheels from the factory with alignment specs set to 22" LPO wheel selected, JET BLACK, PERFORATED LEATHER-APPOINTED SEAT TRIM, FORWARD AUTOMATIC BRAKING, ENGINE, 6.2L ECOTEC3 V8 with Active Fuel Management, Direct Injection and Variable Valve Timing, includes aluminum block construction (420 hp [313 kW] @ 5600 rpm, 460 lb-ft of torque [624 N-m] @ 4100 rpm) (STD). * Stop By Today *Stop by Bleecker Buick GMC located at 926 E 4Th Ave, Red Springs, NC 28377 for a quick visit and a great vehicle!